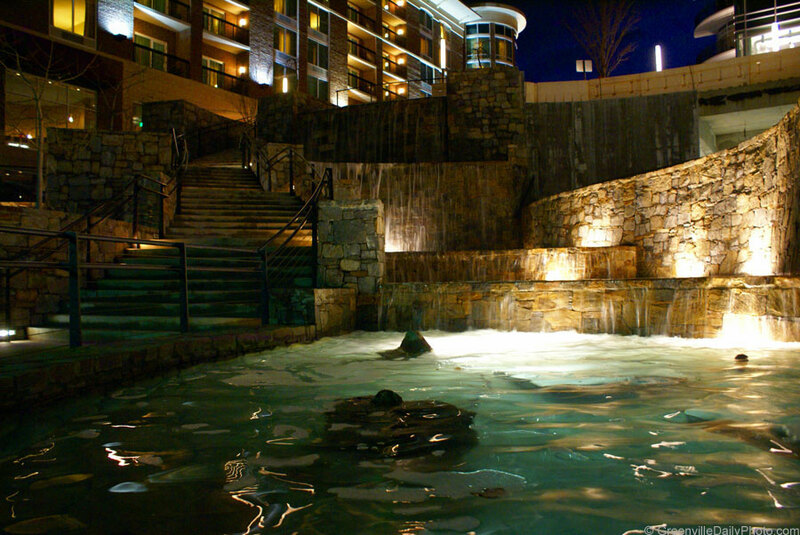 A fountain at the Hyatt Plaza in downtown Greenville. This photo was taken by Denton Harryman. Ducks in the fountain on River Walk in downtown Greenville. This photo was taken by Denton Harryman. Today’s photo shows a mother duck and her ducklings. They were a big attraction as they were perched on a rock in the fountain on River Walk. 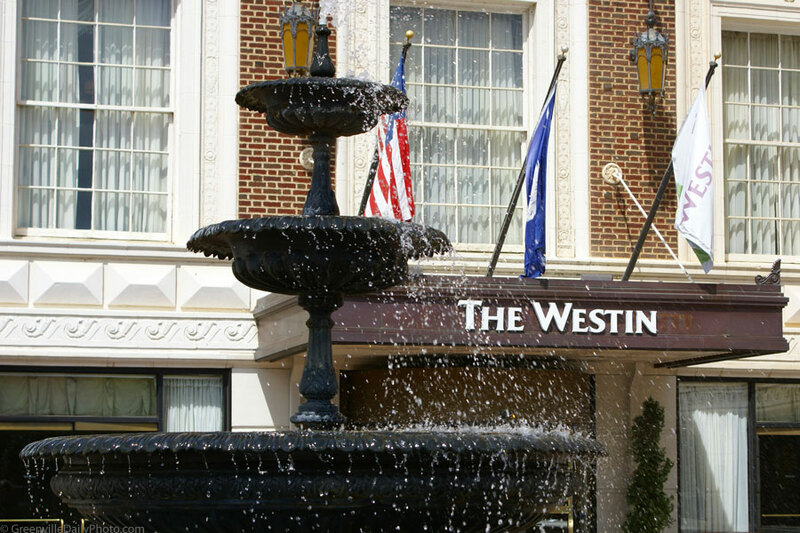 You may remember this photo posted previously showing a larger view of the fountain. Music in the courtyard at Wachovia Place in downtown Greenville. This photo was taken by Denton Harryman. Today’s photo is another tribute to the LOST TV series .. this is a scene in Greenville which is similar to a scene in the LOST finale. 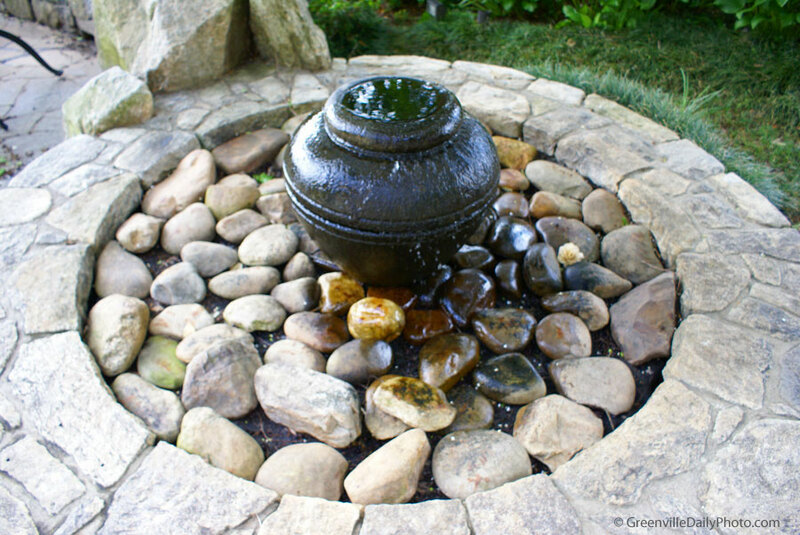 My daughter said, “geesh how many photos of this fountain are you going to share”. She was smiling and teasing a little. That was when I explained that I chose to share this photo because it shows the wind pushing the water around. For me it seems Greenville is experiencing more wind than normal. An article, in the Greenville News, stated we are in for lots of wet weather .. as a result I’m sharing a photo of water as seen in one of the fountains in downtown Greenville .. last night I dropped by the Lazy Goat to say hi to my daughter who was in town with a group enjoying a meal and a show at the Peace Center. On my way to the Lazy Goat I took this photo of the fountain on River Walk. PS: Connie has been selected to be a guest blogger for the Front End of Innovation Europe #FEIEUROPE conference in Amsterdam. Connie was very happy and pleased when she headed off to Europe on Saturday … You can read her blog post at Develop Your Creative Thinking and follower her tweets at Creative Connie. Also; an RSS feed, showing the title of her latest blog post, will appear on the sidebar of Greenville Daily Photo .. Please leave Connie a comment of encouragement. It’s a tough job being a guest blogger (smile). 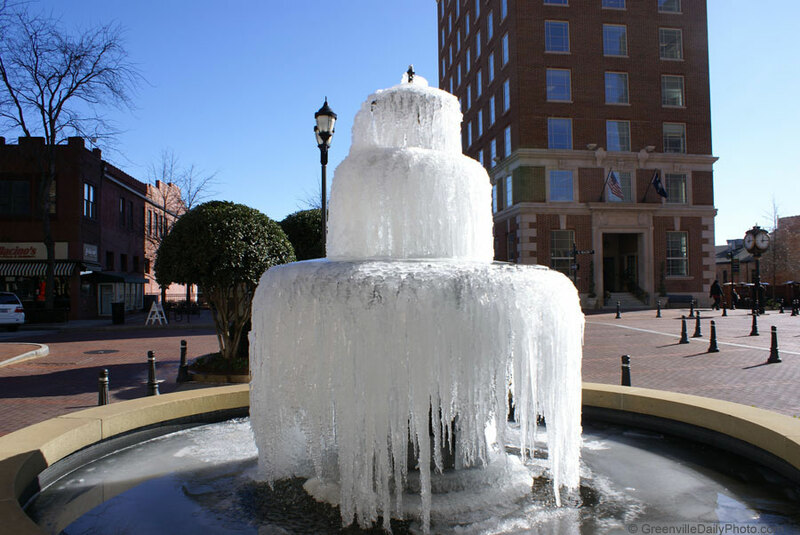 In past years I have shared photos of the fountain in front of the Westin Poinsett .. one of two each year when it is frozen. It has been cold and I look forward to warmer weather in the near future. The rain moved on and the sun came out on Sunday afternoon .. so I chose to share a photo showing the sun, blue sky, and a fountain .. I’m always happy for the rain but the sun puts a smile on my face .. the fountain is next the bus station in downtown Greenville. Sunday afternoon we took our grandson for a stroll in Falls Park. In addition to the Falls, the Reedy River, the fountain; there were also dogs and families and we enjoyed a park swing followed by a little help posting my photo .. It was a very good Sunday afternoon.